Namaskara! Today along with Karishma we explore the local delicacies of Mangalore. The second major city of Karnataka, Mangalore is also known as the gateway of Karnataka. Not only that, it happens to be the largest coastal city in the Malnad regions of Karnataka besides being an educational, commercial and an industrial hub in the west coast of India. Also, an important port city it is one of the most multi-cultural and non-metro cities of our country. Our journey on exploring the amazing delicacies begins with the famous and one of the oldest restaurants in the city, the New Tajmahal Café. Brought to us, were some classic dishes like Rice Pundi which are soft rice dumplings served with chutney and bele thove (moong dal), Kottige also known as gunda in their local language is idli batter served in steamed jackfruit leaves and biscuit roti. Biscuit roti is a famous Mangalorean snack prepared using all purpose flour, semolina, grated coconut and spices. A pocket friendly café, it is known for its Mangalorean dishes. Not to forget, the well-known sweet dish Sanjeera, looks almost like the Kachori served in North-India except that it’s sweet and stuffed with sugar and coconut. Also, when in Mangalore things always end up with the yummiest filter coffee! Our second stop is the Ayodhya Hotel which is well known for its seasonal dishes they serve. 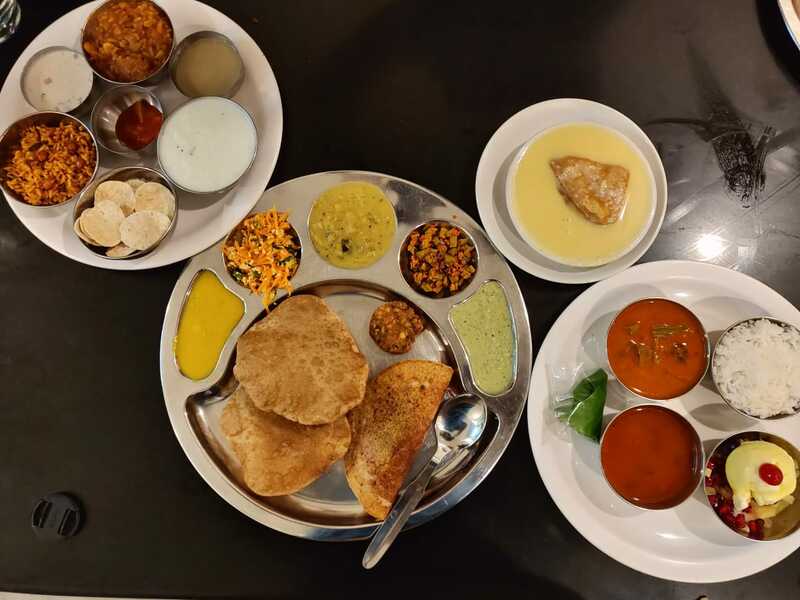 A true highlight of our food tour, this no-frills restaurant accommodates one of the best local and authentic Mangalorean cuisines. We begin with our authentic Mangalorean breakfast with turmeric leaf gatti. These are steamed rice dumplings stuffed with coconut, jaggery and cardamom mixture.Further followed with is, Patrode, a Mangalore style spicy steamed rolls prepared with colocasia leaves and rice. We also tried the Kadpeere podi, a fried dish made up of seasonal vegetables which tastes and looks similar to bitter gourd. Thus, a bit bitter in taste. Another dish which is available only during the rainy season is the tojank biji (sena tora, thakara leaves). These are made of seasonal leafy vegetables. These are really healthy and rich in fibre! We next move on to another well-known dish which is the Moode, these are particularly cylindrical shaped idlis steamed in screw pine leaves. Not to forget, it should be accompanied by the healthy cucumber idli. Also known as, kadamb or Taushe idli they are made using cucumber. We end our meal here, with Raggi mani which happens to be a traditional dessert using finger millets, jaggery and coconut milk and Nai appa, another sweet dish made up of rice jaggery and coconut. Not to forget, try the famous Kalthappam, a pan cake using rice, jaggery, and coconut and cardamom powder. However, the true Mangalorean breakfast only gets completed when you fill yourself up with Payasam also known as rice pudding. Well, we aren’t yet done! But, the variety of dishes that the city presents to you is incomparable and amazing. It soothes your food pallet and makes you only want more. No wonder why it’s truly a food-lover’s heaven!